Thursday night, and I look at Ryan as he was preparing for bed, as usual he took off his necklace, which is silver and has a ‘dog tag’ on it which has Alethea’s handprint that has been digitalised down, her name and date of birth, Alethea and I made it for his second ever father’s day, (through a company called Smallprint) he wears it every day close to his heart and I had a sudden thought that we needed to get one of Liam for him. 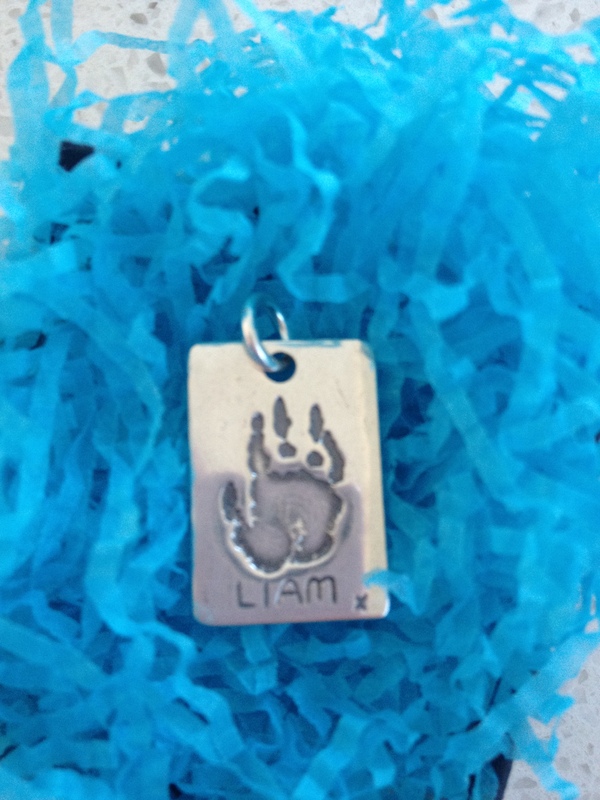 ‘Honey, I totally forgot, would you like a tag with Liam’s hand on it?’ Ryan looks at me with hope in his eyes and says to me that he had thought about it, but hadn’t wanted to upset me by asking for it. I look up the Smallprint website and find Vanessa who covers the northern beaches and I call her mobile, I tell her what we were after and that Liam is dead and that we are leaving hospital tomorrow, is there any chance that she is be able to do this for us. She informed me that although she attends the markets on the northern beaches and services it, she has recently moved to the central coast, my heart sinks, she then says that she will ask her husband if he can look after her children that night and she will drive down for us, and then she changes her mind and says that if she can get her children into day care tomorrow she will come and see us before we leave. Again I was blown away by the extreme length that someone would go to for us and our little man. That night the nurse again gives me 2 sleeping tablets, and this time when I offer Ryan one, as he had not slept the night before he graciously accepts it, again it was a horrible night. Surrounded by newborns crying I bury my head into my pillow and scream and cry until sleep takes over me, but again I wake frequently and look at my little boy’s cot, who has a dead baby, who does this? We woke at day break on Friday morning with knowledge that we were going home, these were to be our last hours with Liam. I ask Ryan to bring Liam to me and I cuddle him and kiss his head, he is so soft, and unlike what people may think, except for his lips being dark red and not as plump as they should be he looks like he is just sleeping, not blue, not smelly, just beautiful. I lay him next to me as I use to when Alethea was a baby and cuddle in close to him, I used to love snuggling with Alethea beside me and falling asleep with her after her early morning feed, it was so innocent, so beautiful and although I can’t feed Liam I can have this one early morning snuggle. Ryan sees what I am doing and he too climbs on the hospital bed, the three of us cuddle, like it should be if Liam was alive and fall asleep, it was the most peaceful and loving experience that we had and a time that I will treasure forever. All too soon we are woken by our nurse bringing in breakfast, I so wished she hadn’t woken us, it was the only time that I was in hospital that I had felt like a family and a mummy and as I wake the realisation sets in that this is not reality, we are not a normal “happy family” and I look at my beautiful boy kiss him and know that it is time we say our goodbyes. Being in hospital meant we were escaping reality, we didn’t have to think about anything while we were there, we didn’t have to deal with “life” we were just existing in our own little bubble, but knowing that there were so many happy people around us and so many babies being born was too much for us to bear. We requested that both our obstetrician and the paediatrician came and saw us before we left, now we had some questions, now that we had a few days to think about it, Ryan and I had decided it was not acceptable to be told that they didn’t know what went wrong and that these things happen, and that it was just “bad luck.” We were told it was bad luck after our first miscarriage then again after the second and third one, we were also told after the 4th it was bad luck, however try the clexane and see if it helped make a pregnancy stay, to come and tell us now that this too was “bad luck” was not fair, you can only have so much bad luck in your life! Ryan had the first shower of the morning and while he did I held my little boy and said all my goodbyes to him, I told him to find my “Pa” in heaven, that he would look after him and cuddle him until I got there, I told him that Pa’s time with him would be short and that mummy would soon be there to kiss him and shower him with all the love that he missed out on, he just needed to wait a little while as mummy needed to be here with daddy and his big sister Alethea, that it was not yet my time to be with him, but when my time did come I would embrace it with open arms longing to see him again. I told my baby boy again what my hopes and dreams were for him and I told him that I had been selfish having those for him, I told him that he was beautiful and that I loved him to the stars and back and that I missed him so much and he would always be part of our family, I told him that our family was forever 4, never just the 3 of us, I promised him that Alethea would grow up knowing that she had a little brother, that I would never hide that from her, I promised my little boy that I would grieve for him, but I also promised him that I would live my life to the fullest, that I would try to live as if he was still here, that although I would miss him and mourn him that I would be the best mummy that I could be to Alethea, and to do that would mean that I was going to have to be a happy mummy, not a sad mummy. I promised my little man that I would think of him always and I hoped that I could live a life that he would be proud of (these are very hard promises to fulfil, because every part of my body wants him, yearns for him, and I think that the easier path to follow is to never resurface, to let it consume me, and envelope myself in sadness, but that was not my promise). I knew that this time that I had with Liam was my last ever by myself and so I sang to him, kissed him and stroked his hair and told him that he was loved beyond compare. Ryan came out of the shower and I handed Liam to him and went for my shower, I had an extra-long one to give Ryan the opportunity to say everything that he wanted to, to his baby boy and when I came out Ryan had tears gently falling down his cheeks, he looked up and nodded his head at me with resolve, he had told Liam all that he needed to say and he knew it was time for us to prepare ourselves to leave. The paediatrician was the first person to come, and we asked him what he thought had gone wrong or did he too believe it was “bad luck” and his response will stay with me forever he said ‘this is not bad luck, this is terrible terrible luck’, that something like what happened to us only happens around once every 2 years, and that this is not normally seen, he told me it was a tragedy and that all the staff involved were in disbelief. He told us that he had been called in and entered the room 20mins into the resuscitation of Liam, but from what he can gather from the notes and how Liam was/wasn’t responding that he believed ‘the last hour of your pregnancy went horribly, horribly wrong’ that he believed we had a perfect pregnancy and unfortunately it had come down to things falling apart in that final hour (So 9 months of pregnancy, in a nutshell came down to 1 hour going horribly wrong!). I said to him ‘I know that you can’t answer this question, but do you think we did the right thing by letting Liam go or should we have fought for him a little more’ and he answered straight away without hesitation that we certainly did the right thing for Liam, that he would have been lucky to make it to 1 year (if everything had of gone perfectly and he survived the transfer and coming weeks) and that he would never have made it out of hospital, his organs had all shut down and he would have died in hospital, if we had of fought for him, he would never have responded to us, or known that we were there, that his life would have been one of extreme pain and suffering and to put him through that would not have been fair. I asked this doctor if he thought that I had done anything that he could possibly think of to cause Liam to die (and I went through a range of scenarios for him) and he reiterated that he believed Liam’s problems came from the last hour of my pregnancy that I did nothing to cause him to die and that every time I thought of laying blame on myself to say ‘Liam’s death is not my fault’. Although he did not give us a definitive answer to what happened to Liam he had made us feel much more at ease, I realised that it wasn’t my fault and Ryan and I had made the “right” choice letting Liam go. Our obstetrician came after the paediatrician and as the paed had answered most of our questions better than anyone else had, we didn’t really have too much to ask him, however we asked again what he thought had gone wrong and he made a few speculations, but said we would know more when my blood tests came back in a couple of days, and to come and see him in his rooms in 2 week’s time and he would go through the results then. We started packing our room and Ryan took everything down to the car, there was lots to take including the numerous arrangements of flowers that had been sent to us. The only thing that was left to do was to wait for Vanessa from Smallprint to come. She came and was so caring of our little baby; she talked to him and was gentle with him. She asked me if there was anything that I would like from her and I said no thankyou that I was fine and she said that she would take an imprint of Liam’s fingerprint and make something up for me, she said that if I didn’t want or like it that I didn’t need to wear it, but she would do it for me anyway just in case I did want one. (At the time I thought of how lovely an idea it was, and how nice she was for suggesting it, however I told myself that it wasn’t something that I wanted or would hold dear to me, when it did arrive in the post however, it was a different story, Vanessa had made me a drop pendant with Liam’s fingerprint on it, his name and date of birth and I fell in love with it straight away) Vanessa was such a beautiful lady with a lovely soul and I thank her for all the effort she went to coming to see us that day. Arriving at our car means that we are outside for the first time since Liam died, I look around, everybody is going about their daily business and I feel trapped inside myself. Ryan starts the car and we drive off, we were meant to leave the hospital as a family, with Liam in the new car capsule that I bought and installed and Alethea in her big girl seat, instead it is just Ryan and I alone in the car. I hyperventilate and sob uncontrollably how did it go so wrong, from my waters breaking till Liam was born was only 3hrs and 44mins, those few hours had changed my life forever. As we travel along in the car I look at all the other drivers and I want to scream at them all, ‘How are you continuing with your lives, do you not know that my baby is dead’ I can’t understand how everything appears so normal, my baby boy who I carried for 9 months and felt his every move, every hiccup is dead, oh God the guilt comes back ‘Liam’s death is not my fault’ words that I say to myself every 5 minutes, no matter what the cause as a mum you believe that the fault lies with you and convincing myself otherwise was extraordinarily hard, there’s that saying that people have used since I was young, ‘Keep putting one foot in front of the other and one day you will turn around and see you’ve climbed a mountain’ for the moment I don’t see the whole mountain, but I have taken the first step, I hope the mountain that I am climbing is Everest, because that is what it feels like! ← You never know how strong you are, until being strong is the only choice you have. Amanda, I am in tears as I reply to this brutally honest, tragic yet heart warming account of your last day with beautiful Liam. 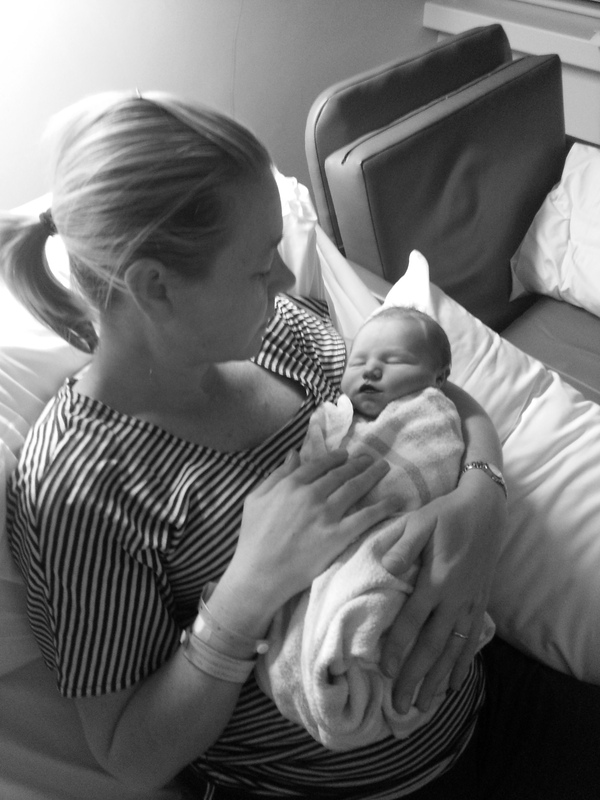 And wow he really was beautiful Amanda, a perfect little angel lovingly wrapped up in his cot. Don’t you ever stop saying those words ‘it was not my fault’ for one day if you say it enough I hope your mind and heart will truly believe it. It was a great honor to meet your precious son and I thank you for allowing me to ‘intride’ on your final hour with Liam and make these pieces for you and Ryan (and maybe big sister Alethea when she is older and understands how special the prints are). Love and strength to your family always. Vanessa, Thanks so much for coming to us on very short notice, in no way did you intrude, we had asked you there! What you have given us are beautiful and will last us a lifetime, we wear them with pride and love…thankyou! Your story has been terribly heart breaking, I am so terribly sorry for you and your family. Ryan and my husband, Darren are friends from way back and we bumped into you at the mall just before you were due, Alethea was at her grandparents and you were enjoying some time out. We had our boys with us who were being mischievous! Darren saw Ryan’s Facebook status with his tatto for Liam and we were extremely sad to see the terrible news, especially as we had just seen you a couple of weeks before all lovely and pregnant. Your blog had me sobbing my heart out for your loss. The photos of baby Liam are so touching, he looked a beautiful, perfect little bubba. I’m sorry I just saw your reply message. It breaks our heart too at how excited you guys were, to then read your blog and the sad, sad news. It was lovely to meet you today. Your strength and courage is an inspiration. I love the photographs you have posted on this blog- Liam is adorable. You said today that at first people didn’t know what to say when you tell them your story and I fear that I may have fallen into that category. Truth be told, I guess there really is very little anyone can say except how truly sorry they are for your loss. Unless they have been there before you, no one can even begin to imagine what you and your family have been through these past few months but with the help of your blog, we can try to understand. You are a beautifully brave woman. And the courage you have to tell your story. You will never truly know how many hearts you have touched. I am a huge supporter of heartfelt and found your blog on referral from their Facebook page. I am crying for you and your beautiful Liam as I read your posts, thank you for your honesty and candor and your willingness to share your story. I just wanted to say I too think Vanessa is wonderful – i had my daughter’s fingerprint done earlier this year and I had many conversations with Vanessa at that time. She is one of the truly special people in this world and I am so glad she was able to do Liam’s prints for you. I share her name, and I have thought of her so much while reading your posts. She is just a little bit older than my own gorgeous girl and I know how much these little ladies need their cuddles! Oh wow that was tough to read. I felt like I was right there with you and it was heartbreaking. Liam was a beautiful baby. I’m so sorry this happened to you – it seems beyond cruel that anyone should endure this. Oh my I can’t imagine your pain or grief. I am so sorry for your loss. It only helps me to appreciate the two beautiful healthy boys I have been blessed to have. Thank you for sharing your journey. Thanks for reading our journey. Yes love and cuddle your boys everyday, they are a blessing that most people don’t even think about until something like this happens to them. Alethea gets extra cuddles these days, just because I can! We are all different in the way we do things, but I to lost my beautiful baby girl I was 34 weeks and had a picture perfect pregnancy with no problems, we never got any answers as to why this happened, Ava was my only girl as I have all boys which I am very thankful for. Reading your story is exactly how I felt, We also had some beautiful pictures taken and we christened our little girl in the family gown that all her cousin have used. Special memories but sometime in anger they are never enough. My boy was also 3 and it is the hardest thing to do and to tell them, I just was full of guilt that it somehow was my fault that I am causing all this pain. We have just pased her 3rd birthday and I still relive that day like it was yesterday. I am really sorry that this happens to us and from one angel mummy to another I hope your days get better. Thanks for reading our story, yes all I need to do is close my eyes and I can remember his smell and how soft he was. Yes I can’t wait to give him big cuddles and kisses…but not yet, as sad as we are there is still a lot more living we have to do. I am glad that people feel like they experienced his birth and death, that was one of the reason why I started my blog, so that our family and friends understood the depths of despair we went through. Amanda, I am sending so much love to you and your beautiful family. I was barely able to read these stories through my tears…oh my heart aches so much for you. The loss of your precious Liam is the cruelest injustice, and the pain I imagine of the very worst kind anyone could endure. This blog particularly grasped at me, as I believe walking away and saying the final goodbye would be the toughest battle of the heart and mind….I’ve often thought I would find that so difficult to do…as you said ‘ you never know how strong you are, till being strong is the only option’ its something you never imagined but you find yourself forced to face….you are brave,you have so much love surrounding you. Writting is a wonderful healer. Thanks for your kind words. Yes I do find that writing is a great healer, I didn’t set out to write and feel better about myself, but it has sort of happened, for me it has been the best therapy of all. I agree the lightness will come back and I will find joy, peace and happiness again, I know it! We too left our baby boy at the hospital. While it was 5 yrs ago now, reading your story makes it feel like yesterday. He was born at 24 weeks with anencephaly. We too met some amazing people and have some very special memories to treasure thanks to them. While I would still choose to have my Simon here with me, I love the thought of him playing with the Angels till I can see him again. We now have two more beautiful children, Daniel is 3 and Samantha is 6 months. I treasure them every day. Hi Amanda. I’m another one getting onto your blog a bit late – through the heartfelt website. I just wanted to say how beautiful your photos and your words are. What an absolutely gorgeous baby Liam was. I am a midwife working in a busy labour ward, and have many times been the person comforting a shocked and confused couple, or standing in the door way holding a beautiful baby, waving goodbye to the bereft family. It is an honour and a privilege to be involved in every one of those families lives. We don’t use heartfelt, but I will certainly be looking into whether they are available to us. At the moment, we take the photos, and I take great joy in giving them to the families as memories, knowing what they have meant to me over many years. Thanks so much for your posts. The words are very real. I feel like I need to thank you for helping people like us, I know that we will always look back fondly at the two nurses who were with us for the 3.5 days we were in hospital, it is people like you who are strong enough to take on this kind of job that make all the difference, you hold our hands and take us through our darkest hours, so thank you. Our 2 nurses took a lot of photos for us as well which we also treasure. As a student Midwife and I read your story and hang on each and every word, thinking how I can empathise and offer support to a family going through your pain. I hope that with your insight I can offer the best I can if/when faced with this situation. No training we are provided has touched me and helped me to understand more than reading your words. I have followed the great work of Heartfelt and know the amazing work they do and try my hardest to spread the word of this invaluable service. I truly hope each day your pain eases and wish you and your family all the best for the future. It is nice to think that our little boys story may help you in the future. You are right Heartfelt do such wonderful work, providing families with memories to last a lifetime. You are right, each day that passes the pain gets slightly less, I know we will have lots of happiness to come, but I think that everything that was once bright is now dimmer than before, and I think that will always remain. I cannot stop crying!!!! Your are such a brave girl! No one should ever have to go through this. My thougts are with you, Ryan and Alethea. Again thanks for your lovely words, unfortunately there are a lot of mums and dads going through exactly the same thing as Ryan and I are going through but they just haven’t verbalised or written down their journey and I feel for all of them, I would never wish any parent to go through this. But that u have had to go through this. What a miracle little boy. He really was just perfect!